Mahi Mahi Charters , Coral Bay’s unique sports fishing specialist operating out of Coral Bay on the Ningaloo Reef in the North of Western Australia. Was a little apprehensive about going on a fishing charter but it was the best thing I have done for ages. The staff and crew were amazing and we all walked away with huge smiles on our faces and I caught my first Red Emperor Yay! Winning. Highly recommend these guys you won’t be disappointed. Was a great tour an it really made our trip! Thanks for letting us on even with my partner on crutches, we had a great time and certainly will be back again! Charter skipper Bernie Vale has done it again. 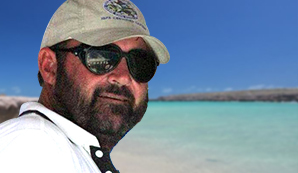 Widely regarded as one of the best in the business in WA, he continues to put his clients on to good fish out of his Coral Bay base. John McIntosh, 71, was one of 10 fisherman from the Dalkeith Bowling Club to enjoy a superb four-day charter with Bernie’s Mahi Mahi. 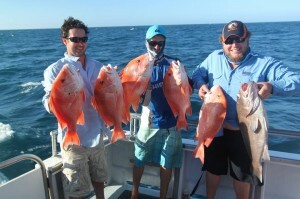 John, a former Claremont and St Kilda footballer and the father of former Eagles defender Ashley, has long been a keen angler and reckoned it was the best fishing trip he’d been on, which is not suprising given they caught 15 Red Emperor over the four days. The best of them came in at 8.6kg and was pulled from 80m of water using trusty Shimano TLD 25. It was a lovely trophy red and John has won a Squidgy pack that he can collect from any of Compleat Angler’s three WA shops. He is in the running to win the monthly prize of a Shirmano rod and reel combo. Former Test opener Geoff “Swampy” Marsh and his clan had a great time at their favourite holiday destination over the last couple weeks. Rather then towing a boat up they booked four days out with gun local skipper Bernie Vale and cherry – picked the best days to head offshore. They had an absolute cracker of a day on Monday, with red emperor to 11kg and many around the 6kg-8kg mark, as well as good numbers of gold-band snapper, and were fishing in 50m-130m using bait. They had their boat limit in an hour on Monday. Over the four days they caught a wide variety of species including Robinson’s sea bream, rosy jobfish, pearl perch, spangled emperor, baldchin groper and rankin cod. Another highlight of the week was a marlin of about 100kg though pelagics were generally thin on the ground.